So, in the midst of a final cleaning of the old apartment, unpacking and settling into the new place (we already have pictures on the walls! 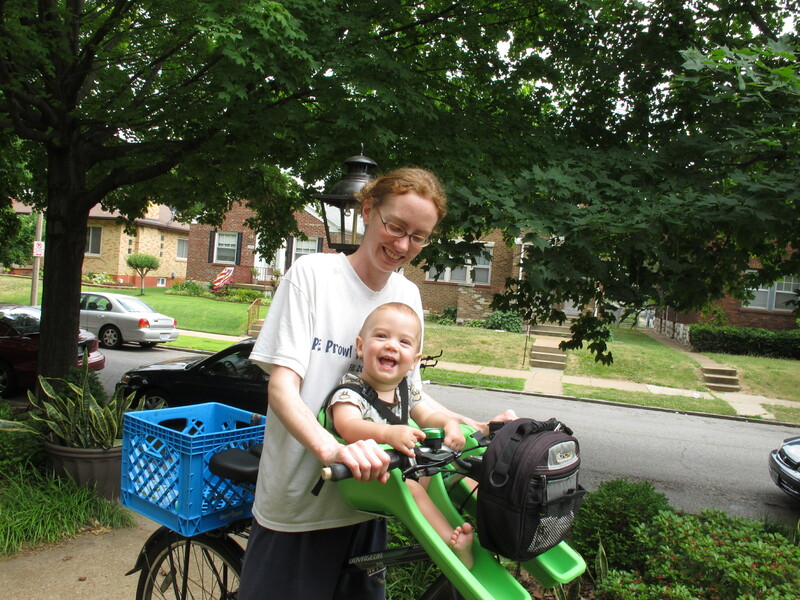 ), and comforting a sick, teething baby, I took my iBert-outfitted bicycle on its maiden voyage with Sir. He wore his new helmet without much complaint and smiled as he sat in front of me, holding the handle bar and intermittently ringing the bike bell. The bike handled fairly normally, and I adjusted to any differences in weight distribution and balance without processing it. It is ironic that I found the seat just before, and used it for the first time just after, we moved to a place with a garage, since one of my major complaints with the trailer was having to lug it up and down the basement stairs. However, the garage is still a good thing because the mounting bar for the iBert attaches right where I usually held my bike for carrying it up and down the stairs, so not having to deal with basement bicycle storage is still a big plus. Sir seemed much happier in the iBert than he did in our most recent trailer rides, and I imagine I was grinning like a fool as we cruised around our new neighborhood. We just rode, and it felt right — simple, easy, and fun. We incorporated a little errand into one of our trips, and I looked forward to more trips by bicycle with my little copilot. This entry was posted in Biking and tagged biking with baby. Bookmark the permalink.